You may have heard NPR’s Morning Edition running their “Unsung Museums” special this summer. 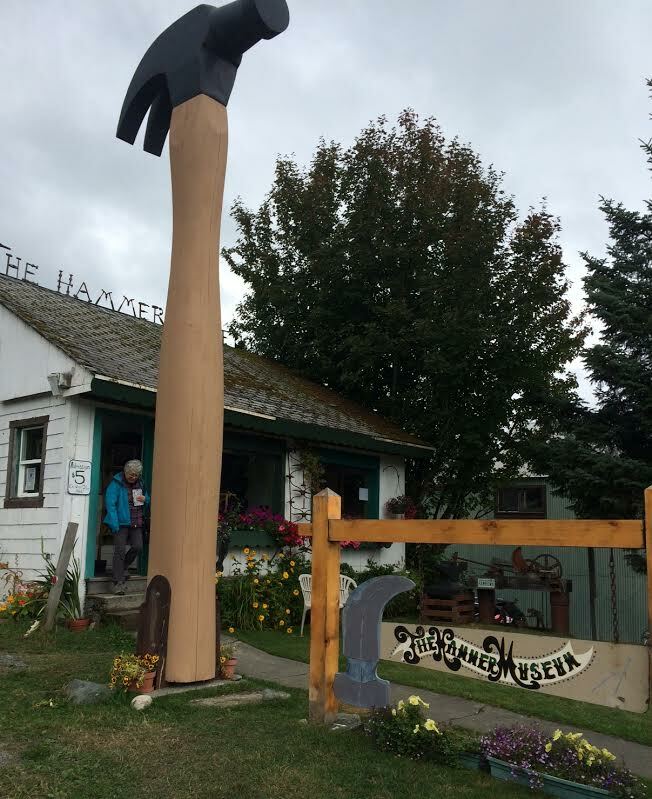 Well it turns out Alaska has its fair share of them, including the hammer museum in Haines. It’s a place where hammers are revered, and boast stories both heartfelt and weird. The Hammer Museum has been open for more than a dozen years, providing a public display not to be matched. Dave Pahl is the founder of the Hammer Museum. Pahl said he didn’t ‘have a clue’ that a tourist attraction would be the end game to his hammer collection, which he started decades ago. The museum features 2,000 hammers on display. And that’s not even all of them. The museum, nestled in a cozy spot just off Main Street and guarded by a 19-foot replica hammer, opened in 2002. It became a nonprofit a couple of years later. Since then, Hammer Museum t-shirts and trinkets emblazoned with cheeky sayings like ‘Nailed it’ and “I got hammered at the Hammer Museum” fly off the shelves in the summer months. On a busy Wednesday, cruise ship passengers crowd into the small space and marvel at the collection. And of course, MC Hammer is playing in the background. To enhance the atmosphere on Wednesdays, the museum busiest day of the week, they play hammer-related songs and MC Hammer – There aren’t a ton of hammer songs, but MC Hammer released at least eight albums. Gloria and Mark Olson are perusing the collection. They’re cruise ship passengers from Battleground, Washington. “There are definitely people that are like ‘oh, I came to look for this hammer very specifically’ and we may or may not have it out on display, but that doesn’t mean it’s not hanging around,” Reed said. “Well, we do have murder hammers, and this is one of these hammers that’s been documented in the visitor’s guide of what we have,” Reed said as she showed off the displays. She shows off the ancient Tlingit Warrior Pick, also known as the ‘Slave Killer.” It’s a stone hammer hundreds of years old that Pahl happened to unearth while digging the building’s basement years ago. He took it as a sign that he was on the right track, and the artifact is now displayed prominently. On average, the hammer heaven sees about 5,000 visitors each summer. Between admission sales – it’s five bucks to get in – t-shirt profits, and grants, the museum makes enough to keep Reed employed for about half the year. The quirky venue pretty much markets itself, but a January spot on the quiz show Jeopardy! definitely helped boost the museum, and the town. 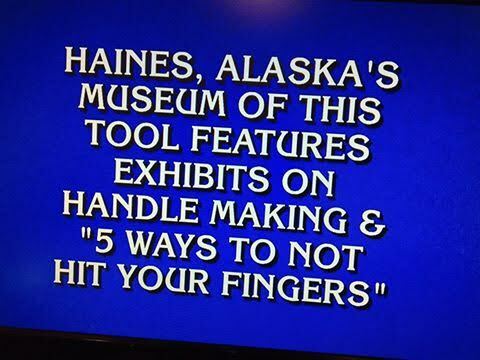 In the category ‘Offbeat Museums’ The $200 clue was “Haines, Alaska’s museum of this tool features exhibits on handle making and ‘5 ways not hit your fingers.’” The guy who buzzed in got it wrong, he said knife. But folks in Haines were bursting with pride after their 15 minutes of fame. 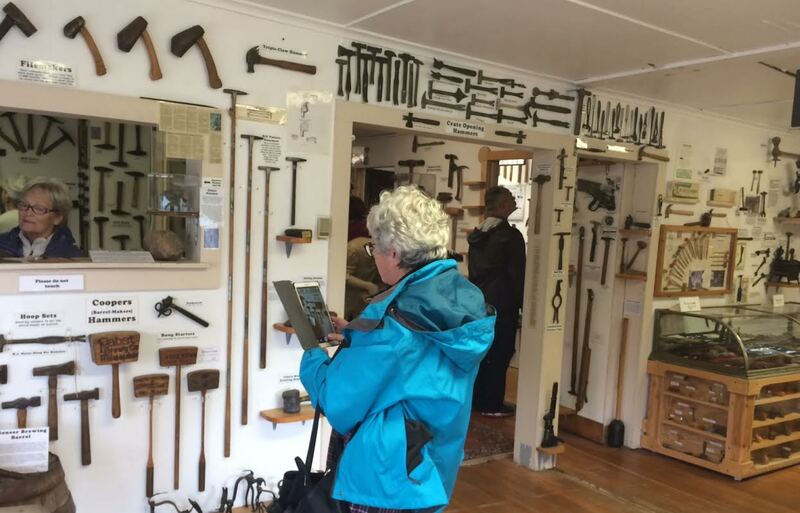 Haines has the only museum dedicated to hammers in the United State. A quick Google search reveals that there are other exhibits around the nation that offer displays of tools, but nothing touches the Hammer Museum here.